Please accept my blessings. I am in receipt of your recent letter undated. The topmost science is this Krsna Consciousness and that is a fact. The so-called modern science has become spoiled for lack of this perspective. Real science means to acquire perfect knowledge from the Parampara, not by so-called academic and empirical research. Such technique is bogus and will not help us in obtaining perfect knowledge. proposition so that the layman and common people may be saved from this rascaldom. You study our books very carefully under the guidance of Amarendra Prabhu and preach our philosophy from Bhagavad Gita and Srimad Bhagavatam in your scientific language. 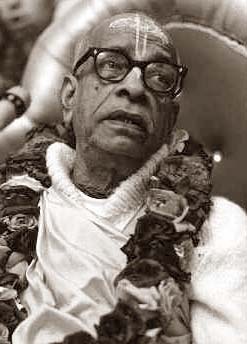 Krsna Consciousness is perfect so it can be substantiated by all means of argument and logic. The main theme is that life has come from life and not generated from matter as they foolishly claim. You just prove this point and it will be a great victory. The Spiritual Master is present wherever his sincere disciple is trying to serve his instructions. This is possible by the mercy of Krishna. In your attempts to serve me and in all your sincere devotional sentiments I am with you as My Guru Maharaj is with me. Remember this always.